I recently bought a new jacket in a unique color, so of course showing it off the day after I receive it in the mail was mandatory. My outfit for this jacket reveal day was subdued with colors (gray and black mostly) to accent the awesome pop of color of the jacket for my SPOTD. 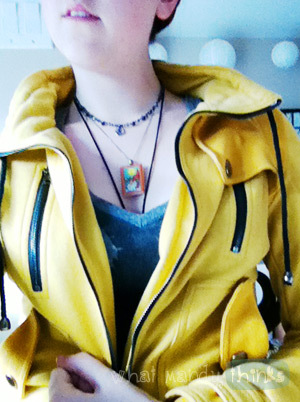 Got me a yellow jacket! - Use a bright pair of shoes as a pop of color. I have orange wedges I use with matching orange shirts, but sometimes I like to wear them with pale and desaturated colors. - Pop out some color with a hair accessory. There's several headbands of various colors I have made from yarn and embroidery thread, but I also have headbands with colors that stand out against my hair color. - Make a statement with an entirely colorful outfit. This is not for the faint of heart, but every once in a while, purple pants with a yellow shirt and pink jacket for example can brighten up your day or at least your office or the street corner you pass to get there. pictures!!!!! it didnt happen unless there's pictures!